“Describing CornerStone to someone is often hard to do,” admitted Debbi Akers, the non-profit’s director. This social worker with a heart for missions spent 19 years at home raising her children and engaging in various local and global mission efforts. When her oldest two children approached college age, she knew she it was time to step more fully into the lives of those she had always been drawn to and as God would have it, a position at CornerStone opened up. One specific area where CornerStone has “listened” and responded to the community is in the area of education and employment. 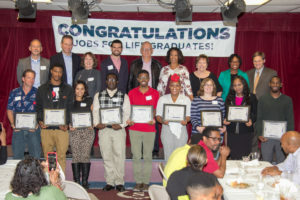 After being introduced to the ministry of an international program called “Jobs for Life (JFL),” CornerStone not only shared their awareness with city and church leaders, but also initiated a local class right in the middle of an under-resourced area in the 35805 zip code. Multiple partners joined in the effort, including Huntsville Housing Authority, and at least three local churches. JFL is a 32-hour course, which offers a discipleship platform enabling churches and organizations to develop gospel-centered relationships, while teaching people God’s design for work. Besides offering a Biblically based curriculum, one facet that sets JFL apart from many other soft skills job training courses is the supportive community that it provides. 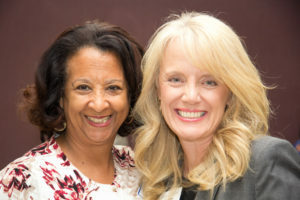 Students are paired with a type of mentor that Debbi refers to as “champions.” She elaborated, “These champions undergo training that helps them recognize the worth and dignity of every individual they encounter. It is training that hopefully keeps our volunteers and champions from going into a community and trying to fix’ people or rescue’ them.” Instead, a champion becomes somewhat of a cheerleader for the JFL student they are paired with. This encouraging relationship mandates a one-year commitment minimum. CornerStone takes no more than 12 students at a time. For every class, each student’s champions sit down with them, eat meals with them, and eventually they become like extended members of each other’s families. In addition, if the student has children, CornerStone and their partnering volunteers provide them with childcare for every class. “Every potential barrier that we can address is removed in order to ensure success for our students,” Debbi explained. Debbi shared the dramatic story of how life-changing this initiative has been for one member in particular: “We had a young man who came to class with his head down, never looking anyone in the eye, his pants sagging, along with his entire demeanor. He often appeared uninterested and even sometimes bothered to be at class. Ironically, his girlfriend was taking the class, also. Initially, instructors were a bit skeptical as to his commitment to the program, but this young man continued to show up and complete his assignments. His “champion” was committed to him and never backed down or became intimidated by the quietness of this young man. But all of the sudden, this young man whose whole world possibly had existed only within a few square miles of his low-income neighborhood, now went from having no significant network to having an expanding network for 25+ people who were committed to his success. He had a different sphere of influence speaking into him, encouraging him, offering him wisdom and advice. Now he had new connections with jobs and people he didn’t know existed before this class. Within weeks, he had people with strong standing in the community who would give him job references… And the “poverty of network and opportunity” took a punch to the gut! “As his commitment to ‘show up’ continued and his desire to make a difference in his own life began to grow, he applied for a job, was encouraged by his classmates and champion, and was hired! He came into class the week after he got the job and the assignment for that night was to do a 90-second commercial about himself. When this man came up for his commercial, he blew everyone away! He came in, standing like a man, straight up – he smiled, spoked confidently and boldly about himself, the things he was good at, and about his dreams for the future! The staff, volunteers and champions in the room had tears in their eyes – ‘What just happened! ?’ they exclaimed. Well, we got to see firsthand the dignity of work – what it did for him – it was phenomenal. We promote this class and teach this philosophy, but when you see it, you believe it with everything within you. We are just so excited for him,” Debbi declared. One area where CornerStone plans to expand their efforts in the coming year is to expand the reach of the Jobs for Life ministry. Just like the local church that has partnered so heavily with them to make this recurring fall class a success, CornerStone hopes to find more churches and businesses willing to invest their time in offering such an opportunity to people throughout this community. It is their plan to offer training for future JFL site leaders so that this expansion can take place. We know that everyone is not ready for a jobs-for-life class. There are so many men and women who need to focus on completing a GED. There are others who could take advantage of the multiple opportunities that exist in this city to expand their employment options through programs at highly reputable institutions like Calhoun and Drake. “We would like to find ways to connect with this community and really promote the fact that the tech school and the community colleges are brief, low cost opportunities that truly certify you for a job. We need to do a better job of delivering this message in a more powerful, attractive way, and following the example of the JFL model, connecting churches to walk with the students through those opportunities. If you’re in survival mode living day to day, you often lose all hope and don’t recognize great opportunities as being for you. At the end of the day, these individuals are not seeking a handout, but instead, simply a hand of encouragement that leads you to an opportunity and empowers you to grasp it. The church has to be willing to step up and walk with the vulnerable and the oppressed in our community. We have to find ways to restore hope and remind people that God has a plan and purpose for their lives. We must toss out the “easy button” of tossing money at poverty and thinking that will solve everything. Poverty is complex. Therefore, solutions that last and can be sustained are just as complex,” Debbi added. For more information or to get involved with the CornerStone Initiative, please visit http://www.cornerstone-al.org/.